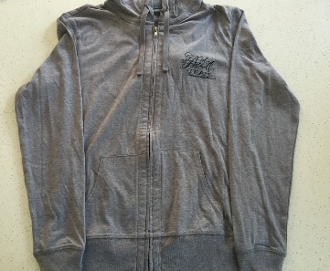 TRUE FIT TATTOO LIMITED COLLECTION: Lightweight full-zip Ladies' hoodie by District. SCPT tattoo-inspired custom design by Tomas Archuleta on the back and small SoCal Pitbull TEAM imprint on left front lapel. 60% Cotton/40% Polyester. Machine Washable. Contact us to Inquire about backordering out of stock items.